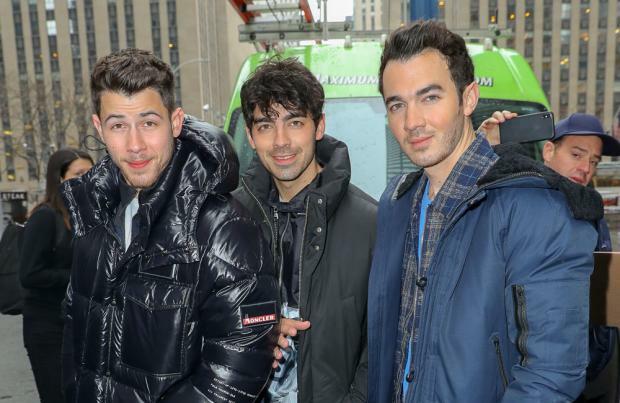 The Jonas Brothers have secured their first ever number one record with 'Sucker'. The group – which includes brothers Nick Jonas, Kevin Jonas and Joe Jonas – topped the Billboard Hot 100 with their eagerly anticipated comeback single, making them the first group this century to debut at the coveted number one slot. They wrote on their joint Instagram account: "Today's a big day people. We're officially celebrating our FIRST EVER #1 on the @billboard Hot 100 plus the first group this CENTURY (and second group EVER) to debut #1 ... We can't thank you guys enough for all the support. We love you guys so much. Also want to give a HUGE thank you to @republicrecords @philymack @ryantedder @frankdukes @louisbellmusic and the rest of the team for all the hard work and putting everything behind this record. This is just the beginning ... #Sucker (sic)"
And the siblings each took to their own social media profiles to thank their fans for their support of 'Sucker', promising there was much more to come from them. Kevin wrote: "Can't thank you guys enough for all the love!! We're so incredibly grateful for you guys. Thank you to @republicrecords @frankdukes @ryantedder @louisbellmusic @philymack and the rest of our incredible team! #1 Debut on the @Billboard Hot 100 LET'S GO!!! #Sucker (sic)"
Nick shared a humorous picture of himself asleep under a duvet with John Stamos' face on, captioning it: "I'll sleep well tonight knowing #sucker is number 1! (sic)," whilst Joe simply posted a video of the #1 plaque on his Instagram story. And in a lengthy message, Nick said his heart was "full of gratitude" for his fans. He wrote: "AHHH!!! This is unbelievable. My heart is so full of gratitude. There was a time I wasn't sure if I was ever going to be able to make music with my brothers again, let alone have a number 1 song on the Hot 100 on Billboard ... This is gonna be an unforgettable ride. Get ready! (sic)"